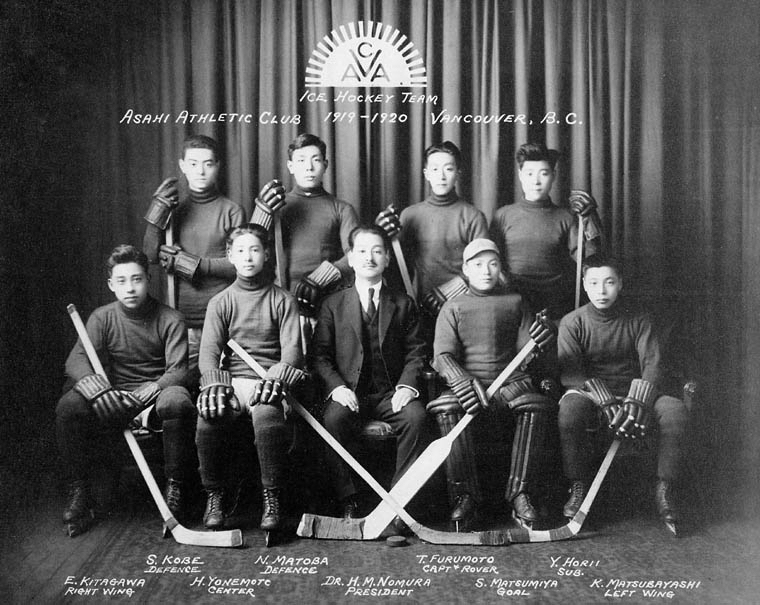 The story of Vancouver’s Asahi Athletic Club’s baseball team is a stirring one, even as it spotlights the shameful history of the Canadian government’s internment of Japanese-Canadian citizens during the Second World War. On a day when Historica Canada is unveiling its latest Heritage Minute (the 91st in that sterling series), you might take a look, here below. The club’s hockey team that’s depicted above is from an earlier generation, 1919-20. For more on the bat-and-ball Asahi, visit Historica Canada’s site (here) and maybe stop in at the page devoted to their history at the British Columbia Sports Hall of Fame, this way. On NHL Ice: Fred Sasakamoose skates for Chicago, circa 1953-54. Great to see Fred Sasakamoose honoured yesterday as one of 124 appointees to the Order of Canada. The pride of Saskatchewan’s Ahtahkakoop Cree Nation started the week with a birthday — he turned 84 on Christmas Day — and yesterday he joined 85 distinguished others in being named a Member of Canada’s highest civilian honour. Best known as a pioneering hockey player, Sasakamoose has also worked tirelessly over the years with youth in his community as well as counselling young people with addictions. It’s high time he was recognized. Hours after the Order of Canada was announced by Governor-General Julie Payette in Ottawa, Sasakamoose was on the ice at Edmonton’s Rogers Place to preside over a ceremonial face-off featuring Oilers’ captain Connor McDavid and Chicago’s Jonathan Toews. 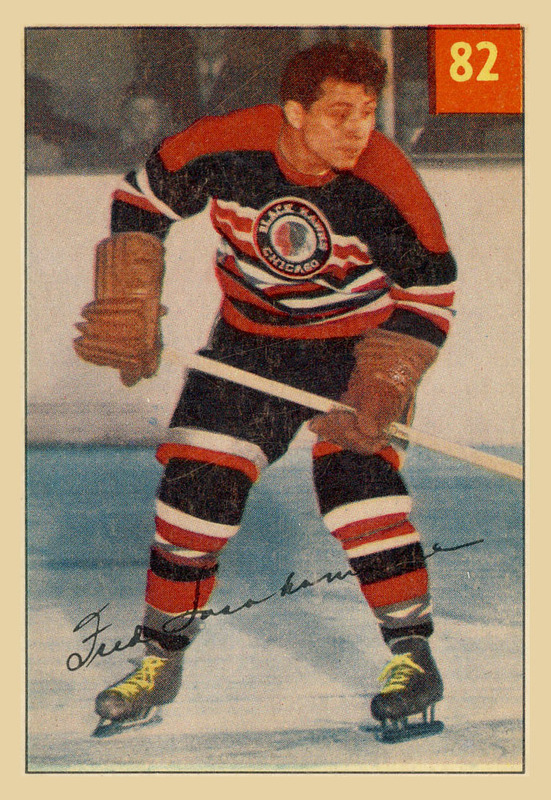 It was the Blackhawks for whom Sasakamoose played his 11 NHL games, debuting as a 19-year-old in November of 1953. As we credit Fred Sasakamoose’s entirely deserving work and experience and achievement, today might also be the day to point out a historical oversight that yesterday’s news from Rideau Hall only served to solidify. Here’s the thing: at least one Indigenous player made it to NHL ice ahead of Sasakamoose’s debut in 1953. 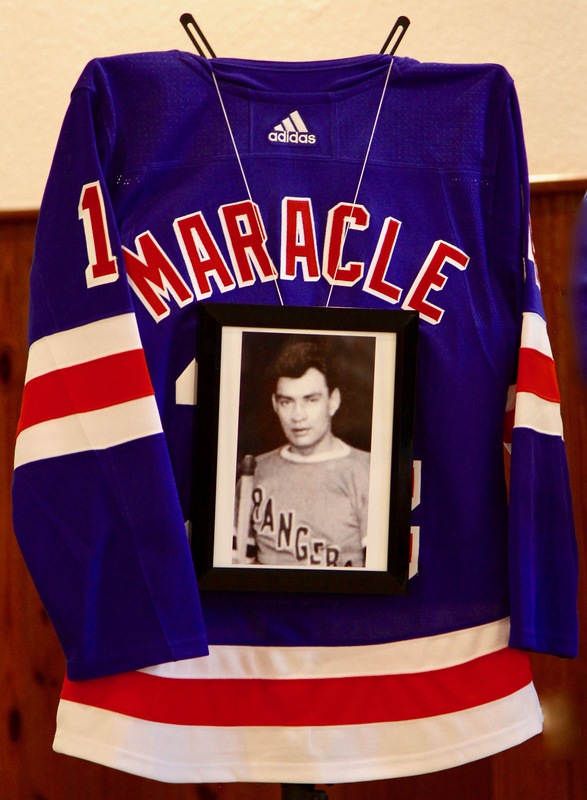 Twenty-two years earlier, in early 1931, 26-year-old Henry Maracle suited up for the New York Rangers. But while the Society for International Hockey Research recognizes him as the league’s first Indigenous player, word doesn’t seem to have filtered out into the wider world. It’s time he was recognized, for that and more. Like Sasakamoose, Maracle played 11 NHL games before he was returned to the minor-league career he’d been pursuing at the time of his call-up. For all his efforts, Sasakamoose’s NHL numbers include no goals or assists to go with his six minutes of penalty time. Maracle made a bit more of a statistical mark, serving four minutes in the penalty box while also aiding teammates with three assists. And he scored a goal of his own. Details of Henry Maracle’s life and career are scanty at best. He was Mohawk, born (very probably) in 1904, in (pretty sure) the town of Ayr in southwestern Ontario. 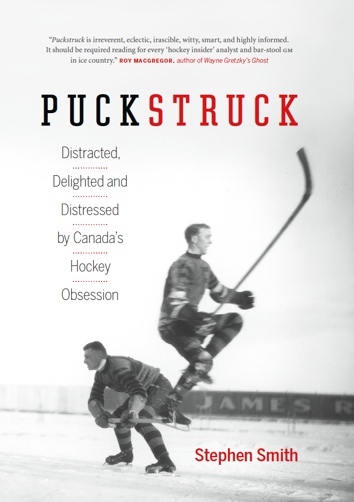 That makes it entirely possible that he skated and maybe even hockeyed on the ice of the Nith River, which is also where, many winters later, Wayne did some of his earliest Gretzkying, in Brantford, just to the south. 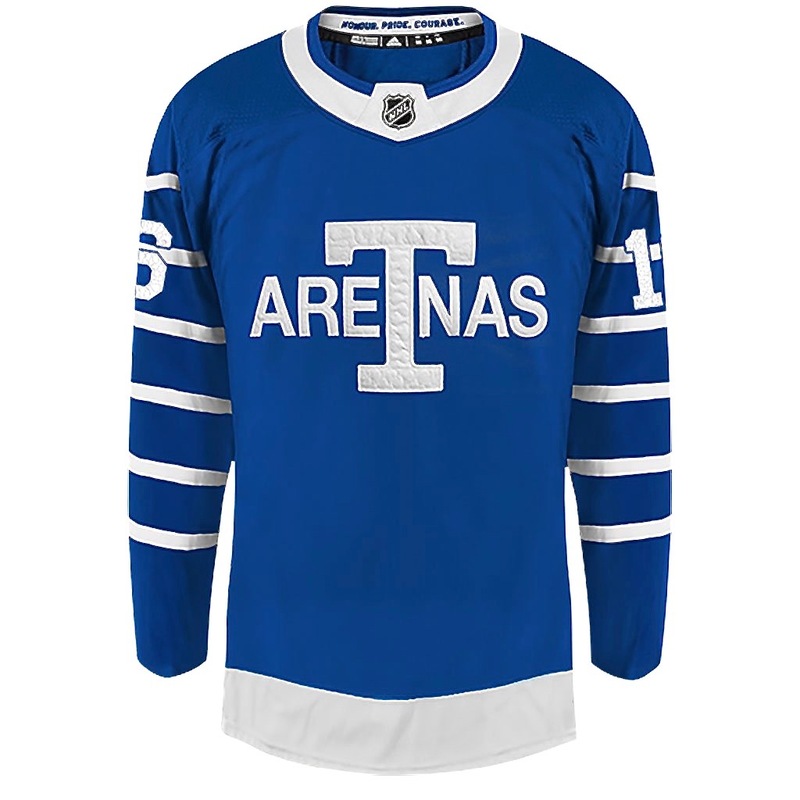 At some point he got to North Bay, Ontario, where he played his junior hockey for the local Trappers alongside future Leafs Gerry Lowrey and Shorty Horne. When Maracle got married in 1924 at the age of 19, he put his pen to an affidavit to get a license, giving his profession as “riveter.” (His wife, 20-year-old Irene Marshall, was a stenographer.) 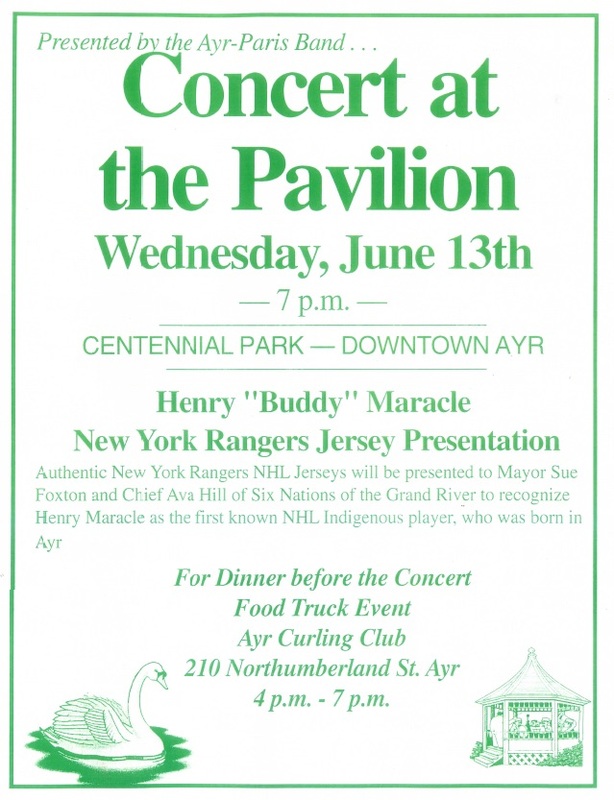 If on official paperwork he remained Henry, he was mostly called otherwise throughout his hockey career: Bud or more often Buddy was his nom-de-glace, though sometimes, inevitably, the papers tagged him Chief Maracle. By 1926 he’d gone professional, graduating to the newborn Can-Am League, where he signed with the team in Springfield, Massachusetts. Maybe Maracle’s background was lost on some who saw him play in those years, but for many it provoked a cascade of cultural stereotyping. For some others, it triggered racist comment that’s no less searing for being so long-ago or casually or smirkingly cast. I’m only going on newspaper clippings; I can only imagine the grotesqueries that Maracle would have faced in person, on the ice and from the stands. Alone this great Indian had snatched the game from the ignominy of defeat to the glories of victory. And when he left the ice, a few seconds later, the entire throng arose and gave one mighty cheer for the original American, first in the forests, first on the trails, and first in the hockey ring tonight. It was Conn Smythe, apparently, who first rated Maracle as potential NHL material. 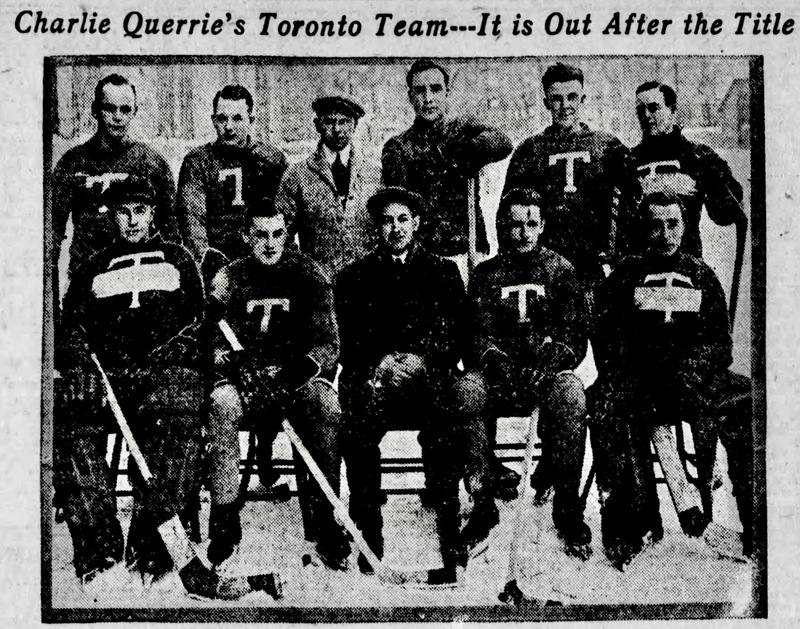 This was in 1926, when the future Leaf panjandrum was (briefly) in charge of assembling the expansion New York Rangers. When Lester Patrick replaced Smythe, he farmed Maracle to New York’s team in Springfield. If nothing else, his presence on [sic] the Rangers’ line-up ought to inspire New York sport writers to write some curdling stories about him. He will probably make his first appearance at Madison Square Gardens all decked out in feathers and a tomahawk or two just to provide a little atmosphere. 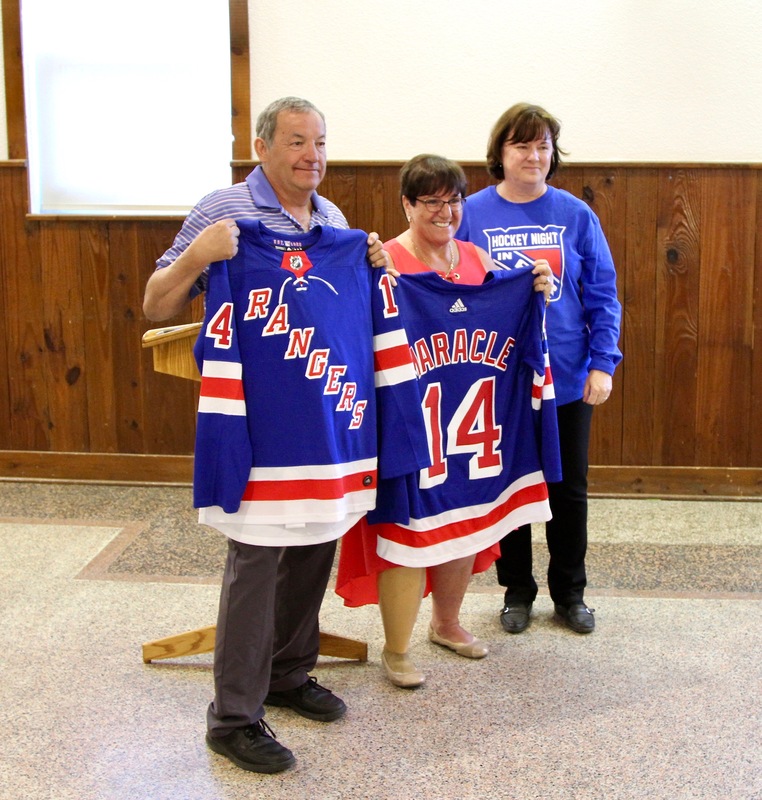 It was in New York next game, Maracle’s fourth, that he made the biggest impression he’d make in his short NHL career. Hosting the Philadelphia Quakers before a not-very crowded crowd of 8,000 at Madison Square Garden, the Rangers won handily, 6-1. When Cecil Dillon scored New York’s fifth goal in the second period, Maracle was the man who set him up to beat Quaker goaltender Wilf Cude. In the third, Dillon returned the favour, assisting on Maracle’s lone NHL goal. Low or high? Shovelled in from the crease or sizzled from afar? I’m afraid the papers don’t yield much in the way of further description of how it happened. To go with the scoring, Maracle did, on this night, take all the penalties he’d take in his NHL career, which is to say, both of them. Buddy Maracle skated in all four of the Rangers’ playoff games in the spring of 1931 before they were eliminated by Chicago. He registered no points and took no penalties. the following fall, Lester Patrick did what he’d done back in ’26, cutting Maracle again, consigning him back to Springfield. There’s not much more to add, at this point, to Maracle’s biography. He played another nine minor-league seasons after his NHL stint, skating on in the Can-Am League for Springfield before moving over the New Haven Eagles. He played for Tulsa’s Oilers in the American Hockey Association before ending up with a series of senior-league teams, including the Detroit Pontiac Chiefs and the San Diego Skyhawks. He died in Dallas in 1958 at the age of 53. Start with Andy Blair. Talking hockey moustaches, you had to start with him: for a long time in the early years of the NHL, his Toronto Maple Leaf lip was the only one in the entire loop to be adorned with any growth of hair. Or so we thought. Turns out hockey wasn’t quite so clean-shaven as we were led to believe. In fact, Blair wasn’t even the first Toronto player to skate mustachioed. Puckstruck exclusive: the NHL’s first recognized moustache made its debut as early as the league’s second season. Jack Adams was the man to wear it. Better known for his later (smooth-faced) exploits as coach and general manager of the Detroit Red Wings, Adams was an accomplished player in his time, too, of course, winning two Stanley Cups in the NHL’s first decade. 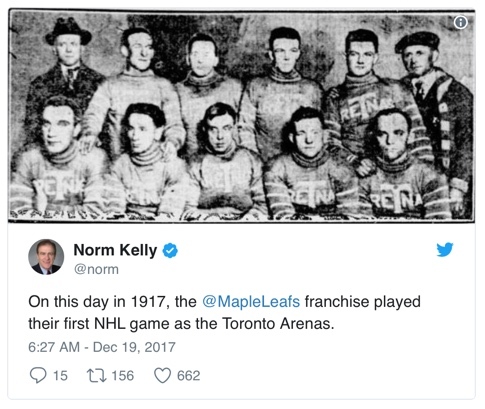 The first of those came in the spring of 1918 with Toronto. a tooth brush decoration on his upper lip. You’ve gotta get pretty close to Jack to see it, as he is a blonde. 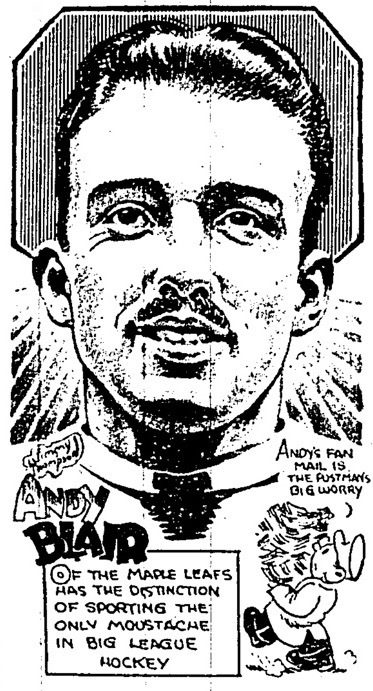 Andy Blair’s moustache was much more distinctive, not to mention very well documented. A Winnipeg-born centreman, Blair made his NHL debut in 1928. As best we can trace, he came into the league smooth-faced. The evidence isn’t conclusive but as far as we know he did get growing until the early 1930s. 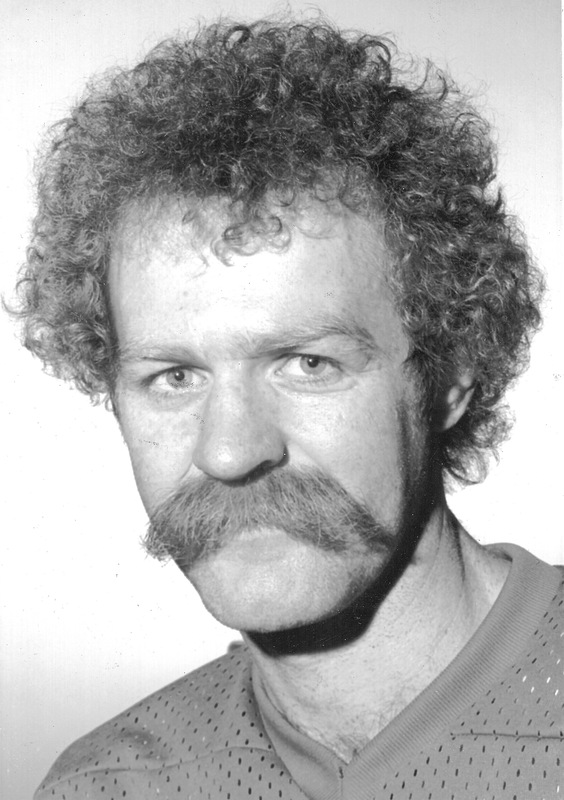 When we think of classic Leafian moustaches, it’s Lanny McDonald’s full-frontal hairbrush that comes to mind, or maybe Wendel Clark’s fu manchu. Blair’s was trim. A teammate, Hap Day, described it as “a little Joe College-type.” Trent Frayne preferred “Charlie Chaplin.” It even rates a mention in Blair’s biography in the Hockey Hall of Fame register of players — even though it didn’t survive the end of his NHL career. After eight seasons with the Leafs, Blair and his laden lip went to Chicago in 1936 for a final fling with the Black Hawks. Blair, at least, lasted the year: “I see the boys got together and made him shave off his Clark Gable moustache,” former Leafs teammate Charlie Conacher noted that year. “That is something more than we could get him to do when he played in Toronto.” The story goes that it disappeared under duress: only after his Chicago teammates repeatedly threatened to do the job forcibly did Blair get around to shaving the moustache away. One On One: Two-year-old Annette Dionne, wearing Boston Bruins colours, faces her Maple Leaf’d sister Yvonne at their Corbeil, Ontario, nursery in 1936. The story of the Dionne quintuplets is a long one, and sad enough. The latest chapter, which Ian Austen narrated in The New York Times over the weekend, continues to unfold tonight when the city council in North Bay, Ontario, votes on the future of the tiny log farmhouse where 24-year-old Elzire Dionne gave birth to her seventh, eighth, ninth, tenth, and eleventh children on May 28, 1934. That summer, another newspaper reported, upwards of 6,000 visitors a day paid for the privilege of spying on them. Later, the original house later became a museum. 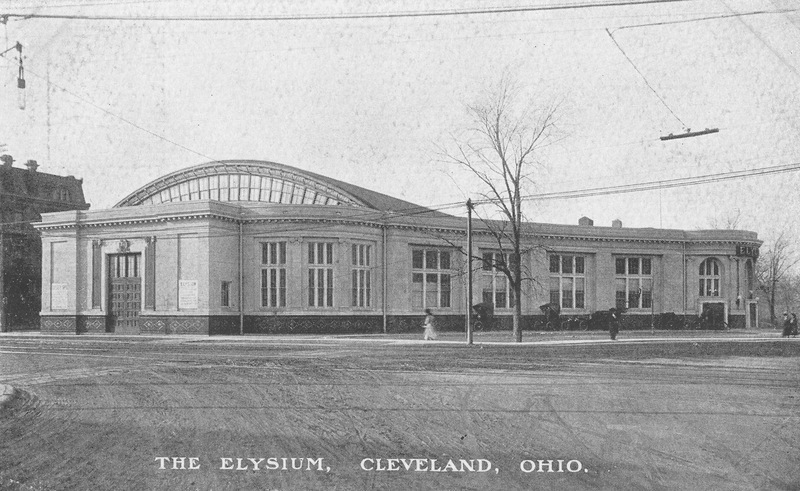 In 1960, it was moved to a site on the edge of North Bay. The city owns the house now, but wished it didn’t. The museum has been closed since 2015 and the land beneath it has been sold for development. Unwilling to maintain the house, or to pay to move it elsewhere in the city, North Bay was looking to sell it down the highway, to an agricultural society in Strong, Ontario, where it would feature in a new pioneer village. The two surviving quintuplets, Annette and Cécile Dionne, are 82 now. They’ve written to North Bay councillors to suggest that they have a “moral obligation” to maintain the home as piece a Canadian history. With that and the attention that the feature in the weekend Times has focussed, the city is considering a new plan. That’s the one they’re voting on tonight. If passed, it would see North Bay retain ownership of the house and pay for its relocation to a downtown site near the Discovery North Bay Museum. While we wait on word on which way the vote goes, a review of the quintuplets’ hockey careers is (obviously) in order. We know (for instance) that Yvonne, Annette, Cécile, Émilie, and Marie didn’t attend their first professional game until 1948, when they were 14. The Chicago Black Hawks visited North Bay in October of that year to play an exhibition game against the Kansas City Pla-Mors of the United States Hockey League. The New York Times reported on that, too, which is to say it carried the Canadian Press dispatch of the proceedings, noting that the girls attended the game with their father, Oliva, along with several schoolmates, as guests of Hawks president Bill Tobin. Chicago prevailed, 8-5, with Ralph Nattress and Gaye Stewart leading the way with two goals each. Emile Francis was in goal for the Hawks, with Al Rollins facing him from the Kansas City net. Chicago coach Charlie Conacher and his Kansas counterpart, Reg Hamilton, presented the girls with sticks autographed by their players. As the night went on, North Bay mayor Ced Price treated the Dionnes to candied apples and popcorn.